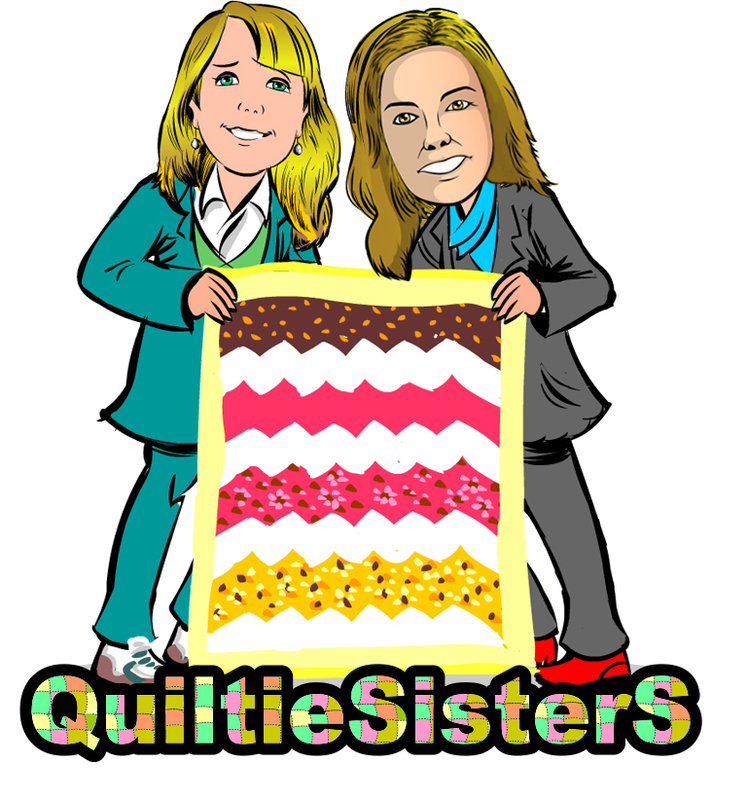 What’s on the QuiltieSisterS design wall now? Would you believe me if I said a Turkey? 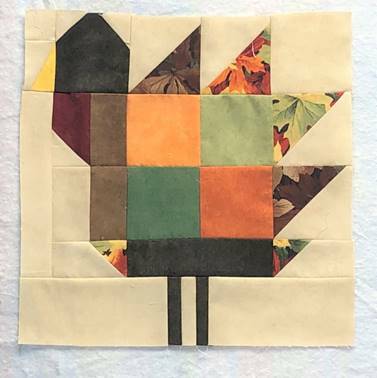 When Judy told me she had designed a turkey table runner quilt kit and wanted me to test it out, I thought she was crazy! When I cut it out, I really thought she was crazy with all the small pieces, but what fun it was to sew up the precision die cut pieces and quilt it for my table. Literally something you can do in a day. In fact, this is the perfect project to buy as cutting out the small pieces requires a very steady hand. Happily, our precision dies take care of that problem! This kit uses some of our favourite fabrics (Maywood Studios’ Shadow Play and Falling Leaves Collection) bringing in all the fall colours in a fun and inviting way. I love the yellow beak and the brick red gullet. While we’re designing this as a table runner, it can just as easily be turned into a wall hanging. We also think it would be great to appliqué an eye onto the Turkey to give him further personality. Below is a sneak peek at what a block will look like. If you’re interested in purchasing the kit before it’s up on our Etsy site (https://www.etsy.com/ca/shop/WillowCreekByHeather), just send us a quick note at info@quiltiesisters.com and we’ll confirm your order. The kit will measure approximately 50 x 15” and will sell for $30 Canadian + tax and shipping. We expect it will be available for shipping by October 20th. It might be too late for Canadian Thanksgiving (or super early!) but it’s just in time for American Thanksgiving. I wonder what Judy will be thinking up next?! Gobble Gobble! P.S. If you don’t sew or quilt, ask us about completing the project for you. Our prices are reasonable as we love to sew and quilt our own kits! Congratulations to the Yorkshire Rose Quilt Guild of Toronto for the amazing quilt show they put on over the weekend. The quilts were inspiring and the hospitality truly welcoming. Thanks to everyone who dropped by our booth. We are working on updating our site with all of our new kits which should be complete later this week. I’m the meantime, if you don’t see something listed here, just send us a quick email at info@quiltiesisters.com or call us at 416-844-4014. We are excited to be part of the 2018 Yorkshire Rose Quilt show as vendors. 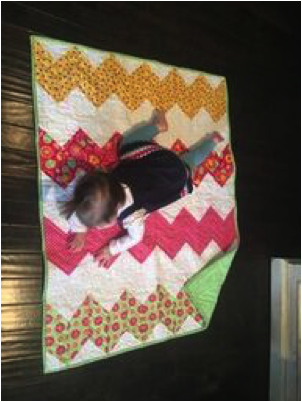 With over 30 different quilt kits, we hope to meet new quilters and share our offerings for busy people looking for that quick and fun project! The Yorkshire Rose Quilt Guild Please stop by to say "Hello" at our booth, see some beautiful quilts on display, enjoy the tea room and to share some quilt friendship with us if you are in the neighborhood. May 15 to 17, 2018 the Region of York Quilters Guild is hosting three days of Master Classes by the best-selling author, enthusiastic and encouraging teacher, award-winning quilter, fabric designer, and talented and spell-binding speaker, Ricky Tims! And QuiltieSisterS has included our Flying Geese Coaster Sample Kit into the gift bag attendees will receive. The sample kit is a great example of the quality you can expect in a QuiltieSisterS kit with professional die cut triangles (dog ears trimmed) accurately cut using quilt shop quality fabric. If you attend the Ricky Tims event, you can find Instructions for Flying Geese Coaster Sample Kit HERE. We hope you enjoy the sample and take time to check out our kits on this site. If you’re interested in attending the event, please register at Ricky Tims Event Info. 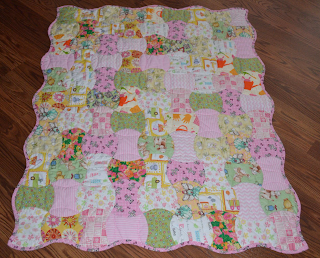 For a listing of existing QuiltieSisters quilt kits please go here . Every quilt has a story and our scrappy quilt kit is no exception. 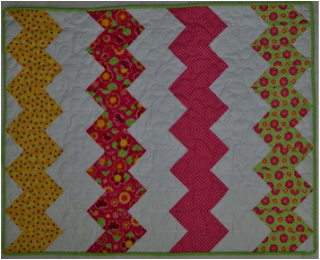 shows you the fabrics and the precision cutting including the notches that you get with this quilt kit. Our Mom, who’s in her early 80’s, was equally interested in trying her hand at curved piecing. She was hesitant at first, however, she found the notches ideal to ensure the piecing matched every time. She also found that by keeping her sewing speed slow and steady, she could control her seam allowances around the curves. It turns out she loved curved piecing so much, she has made several scrappy quilts of her own. Mom has also started sewing another curved pieced quilt -- a Double Wedding Ring quilt kit which we have been preparing for release and adding to our store in the near future! We backed one of our samples in flannel and a second in Minky (yes the dreaded slippery material) which made it extra cuddly. 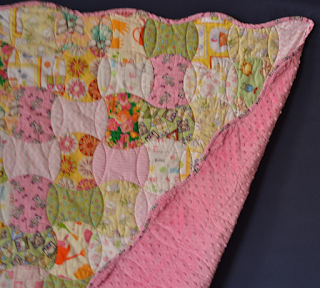 The circle quilting Judy did on her longarm machine was another way to bring the apple core design to life. We are so thankful for you and the opportunity to be a part of this amazing crafting community. It's sew fun to create! When we started creating quilt kits, we decided to focus on something all of us need on a regular basis – baby quilts. And while we often have lots of advance knowledge of the arrival of a new baby, it can sneak up on us. With these pre-cut kits, many of our clients find this a simple, fast and easy way to create a high-quality gift that will be cherished for years to come . 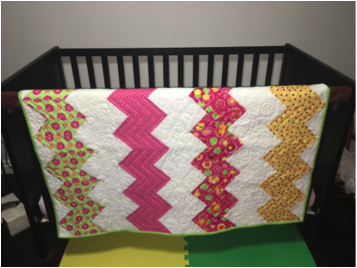 Rosie’s Garden Chevron kit was inspired by Judy’s granddaughter and is also featured on the QuiltieSisters Caricature and logo. We’ve included a few pictures of her having fun playing on the quilt. Like all our kits, it uses a precision die cutting system to create the chevron and triangle shapes, letting you have fun working with this simple design, without having to cut it out! With the pre-cut pieces, your cutting time is reduced by 95% allowing you to sew this quilt top in an afternoon. You will also find that the chevron shape makes this SO much quicker than using half square triangles!